LONDON (Reuters) - Google will be forced to change the way its search results are presented in Europe or face antitrust charges for "diverting traffic" to its own services, The Financial Times reported the European Union's antitrust chief as saying. "They are monetizing this kind of business, the strong position they have in the general search market and this is not only a dominant position, I think - I fear - there is an abuse of this dominant position," he said. Google has been the center of a two-year investigation by the EU based on complaints that Google unfairly favored its services over its rivals in search results and that it may have copied material from travel and restaurant websites without permission. Almunia told the newspaper that his concern was "the way they present their own services" and that he was "not discussing the algorithm" the top-secret formula behind Google's search engine. Almunia's spokesman confirmed the quotes in the FT but said they did not add a new position on behalf of the European Commission. "He was highlighting that we think the preferential treatment may lead to diversion of traffic, which we consider anticompetitive. That's a basic concern we have as we explained last May," the spokesman, Antoine Colombani, told Reuters. The EU's stance on Google marks a sharply different approach to that of U.S. regulators, who last week ended their investigation into the company and concluded that it had not manipulated its Web search results to hurt rivals, a verdict which disappointed its rivals. Almunia told the FT that the EU's rare divergence with the U.S. was due to the differing legal standards for abuse of dominance, as well as Google's stronger position in Europe where it handles more than 90 percent of searches. He also dismissed the idea that an intervention would cause a rift with the US and trigger outrage at a European meddling with a US corporate giant. He said, "I have never received a single message coming from the other side of the Atlantic saying, 'hey, what are you doing?' Everyone knows this is global." Almunia said a separate a less advanced probe into Google's Android's operating system will remain open and outside the settlement. A new report adds weight to recent rumors suggesting Apple (AAPL) is preparing to launch one or more new iPhone models by mid-2013. In a note to investors on Monday, Canaccord Genuity analyst T. Michael Walkley told clients that Apple’s iPhone 5 saw “very strong” demand in the holiday quarter, likely pushing cumulative sales for fiscal 2013 above analysts’ consensus to 173 million units. Moving into the summer months, Walkley sees Apple launching a new “higher-end iPhone” sometime in the June quarter, and a low-end model could be in the works as well. An earlier report from Topeka Capital Markets analyst Brian White suggested that Apple is planning to launch the “iPhone 5S” in May or June with several new color options instead of just black and white. He also said Apple will launch two different versions of its new iPhone, one with the current 4-inch display and a second smaller version at a lower cost that will target emerging markets. Walkley reiterated his Buy rating on Apple shares with a 12-month price target of $750. 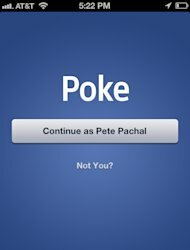 Apps like Snapchat and Facebook Poke let users send short messages, photos or videos that automatically self-destruct after a few seconds. However, it's actually very easy for a recipient to save some of those messages permanently -- and without the sender knowing. Both apps will alert the sender if the recipient takes a screengrab of whatever was sent, of course, but by connecting your phone to a PC or Mac, the messages can be secretly offloaded without the sender knowing -- a possibility first reported by BuzzFeed. For an iPhone, all you'll need is a third-party file manager like iExplorer. PARIS (Reuters) - The French government said it would extend to the end of January the deadline for talks between Google Inc and the French press to settle a dispute over the search engine's links to online news articles. Press associations in France, and other European countries, want Google to pay when it displays links to newspapers in Internet searches. In reply, Google has threatened to stop indexing articles from the French press. Talks between the search engine and French publishers, which the government said are advancing, were expected to wrap up by the end of the year. If no deal were struck, France would press ahead with a law that would force Google to pay for the right to provide links to online news articles. (Reuters) - Google's Motorola Mobility unit cannot assert a patent against Apple Inc which covers a sensor that stops phone users from dialing wrong numbers on touchscreen devices, a U.S. trade judge ruled. In an entry on the U.S. International Trade Commission docket on Tuesday, Administrative Law Judge Thomas Pender ruled the Motorola patent invalid. "We're disappointed with this outcome and are evaluating our options," Motorola spokeswoman Jennifer Weyrauch-Erickson said. An Apple spokeswoman declined to comment. Apple has been litigating around the world against various manufacturers of phones that operate on Google's Android operating system. Google acquired Motorola Mobility for $12.5 billion this year, partly for its library of telecommunications patents. In August, the commission found that Apple had not violated three other Motorola patents, and ordered Pender to further examine the touchscreen sensor patent. The full ITC will now review Pender's latest ruling. The case in the ITC is In the Matter of Certain Wireless Communication Devices, Portable Music and Data Processing Devices, Computers and Components Thereof, 337-745. SAN FRANCISCO (Reuters) - Two weeks before a high-stakes trial pitting Google's Motorola Mobility unit against Microsoft, Google made what has become a common request for a technology company fighting for billions of dollars: A public court proceeding, conducted largely in secret. Google and Microsoft, like rivals embroiled in smartphone patent wars, are eager to keep sensitive business information under wraps - in this case, the royalty deals they cut with other companies on patented technology. Microsoft asked for similar protections in a court filing late on Thursday. Such royalty rates, though, are the central issue in this trial, which begins November 13 in Seattle. U.S. District Judge James Robart has granted requests to block many pre-trial legal briefs from public view. Though he warned he may get tougher on the issue, the nature of the case raises the possibility that even his final decision might include redacted, or blacked-out, sections. Widespread sealing of documents infringes on the basic American legal principle that court should be public, says law professor, Dennis Crouch, and encourages companies to use a costly, tax-payer funded resource to resolve their disputes. "There are plenty of cases that have settled because one party didn't want their information public," said Crouch, an intellectual property professor at University of Missouri School of Law. Tech companies counter that they should not be forced to reveal private business information as the price for having their day in court. The law does permit confidential information to be kept from public view in some circumstances, though companies must show the disclosure would be harmful. Google argues that revelations about licensing negotiations would give competitors "additional leverage and bargaining power and would lead to an unfair advantage." Robart has not yet ruled on Google and Microsoft's requests, which, in the case of Google includes not only keeping documents under seal, but also clearing the courtroom during crucial testimony. It is also unclear whether Robart will redact any discussion of royalty rates in his final opinion. The judge, who will decide this part of the case without a jury, did not respond to requests for comment. Google bought Motorola for $12.5 billion, partly to use its large portfolio of communications patents as a bargaining chip against its competitors. Apple, for its part, is set to square off against Motorola on Monday in Madison, Wisconsin, in a case that involves many of the same issues. In Wisconsin, Apple and Motorola have filed most court documents entirely under seal. U.S. District Judge Barbara Crabb did not require them to seek advance permission to file them secretly, nor did she mandate that the companies make redacted copies available for the public. In Apple's Northern California litigation against Samsung, both parties also sought to keep many documents under seal. After Reuters challenged those secrecy requests, on grounds it wanted to report financial details, U.S. District Judge Lucy Koh ordered both companies to disclose a range of information they considered secret - including profit margins on individual products - but not licensing deals. Apple and Samsung are appealing the disclosure order. In response to questions from Reuters last week, Judge Crabb in Wisconsin, who will also decide the case without a jury, acknowledged she had not been paying attention to how many documents were being filed under seal. Federal judges in Madison will now require that parties file redacted briefs, she said, though as of Wednesday, Apple and Motorola were still filing key briefs entirely under seal. "Just because there is a seed or kernel of confidential information doesn't mean an entire 25-page brief should be sealed," said Bernard Chao, an intellectual property professor at University of Denver Sturm College of Law. "Whatever opinion I make is not going to be redacted," she told Reuters in an interview. Microsoft sued Motorola two years ago, saying Motorola had promised to license its so-called "standards essential" patents at a fair rate, in exchange for the technology being adopted as a norm industrywide. But by demanding roughly $4 billion a year in revenue, Microsoft says Motorola broke its promise. Robart will sort out what a reasonable royalty for those standards patents should be, partly by reviewing deals Motorola struck with other companies such as IBM and Research in Motion - much like an appraiser checking comparable properties to figure out whether a home is priced right. In this case, though, the public may not be able to understand exactly what figures Robart is comparing. Representatives for Microsoft and Google declined to comment. In its brief, Microsoft said licensing terms could be sealed without the need to clear the courtroom. "Permitting redaction of this information will minimize the harm to Microsoft and third parties while also giving due consideration to the public policies favoring disclosure," the company argued. IBM and RIM have also asked Robart to keep licensing information secret. Chao doesn't think Robart will ultimately redact his own ruling, even though it may include discussion of the specific royalty rates. "I can't imagine that," he said. Most judges cite lack of resources and overflowing dockets as the reason why they don't scrutinize secrecy requests more closely, especially when both parties support them. In Wisconsin, Crabb said that even though she will now require litigants to ask permission to file secret documents, it is highly unlikely that she will actually read those arguments - unless someone else flags a problem. "We're paddling madly to stay afloat," Crabb said. The Wisconsin case in U.S. District Court, Western District of Wisconsin is Apple Inc. vs. Motorola Mobility Inc., 11-cv-178. The Seattle case in U.S. District Court, Western District of Washington is Microsoft Corp. vs. Motorola Inc., 10-cv-1823. SAN FRANCISCO (Reuters) - A U.S. appeals court on Friday ruled that Google Inc's Motorola Mobility unit cannot enforce a patent injunction that it obtained against Microsoft Corp in Germany, diminishing Google's leverage in the ongoing smartphone patent wars. The injunction would have barred Microsoft from "offering, marketing, using or importing or possessing" in Germany some products including the Xbox 360 and certain Windows software. The ruling against the German injunction came from the 9th U.S. Circuit Court of Appeals in San Francisco. Microsoft deputy general counsel David Howard said the company was pleased with the ruling. A representative for Google's Motorola unit declined to comment. Brian Love, a professor at Santa Clara Law school in Silicon Valley, said the decision helps Microsoft counteract a favorable dynamic for Google in Germany. "To some extent Germany has a reputation as place you can go and get an injunction relatively easy," Love said. The current Xbox 360 is the market-leading console in the United States. Microsoft is expected to unveil its next generation Xbox video game console in 2013. Microsoft has said that Motorola's patents are standard, essential parts of its software and that Motorola is asking far too much in royalties for their use. Google closed on its $12.5 billion Motorola Mobility acquisition this year. Microsoft sued Motorola in the United States in 2010, and Motorola then filed a lawsuit in Germany. Earlier this year, Microsoft announced plans to move its European distribution center to the Netherlands from Germany ahead of a possible injunction. After a court in Mannheim issued the sales ban, U.S. District Judge James Robart in Seattle granted Microsoft's request to put the German order on hold earlier this year. According to Robart, the ruling would remain in effect until he could determine whether Motorola could appropriately seek a sales ban based on its standard essential patents. In its ruling on Friday, a three-judge 9th Circuit unanimously upheld Robart's order. Since Microsoft had already brought a lawsuit against Motorola for breach of contract in the United States, U.S. courts have the power to put the German injunction on hold, the 9th Circuit said. "At bottom, this case is a private dispute under Washington state contract law between two U.S. corporations," the court ruled. European regulators are investigating claims that Motorola over-charged Microsoft and Apple Inc for use of its patents in their products and thereby breached antitrust rules. The case in the 9th Circuit is Microsoft Corporation vs. Motorola Inc, Motorola Mobility Inc and General Instrument Corporation, 12-35352. NEW YORK (AP) — Facebook is rolling out a service called Gifts which, as its name suggests, lets users send chocolate, coffee, socks and other real-life presents to one another. Facebook Gifts launched Thursday to a subset of users in the U.S. and will roll out to more over the coming months as people begin to send gifts to each other. The icon will also show up on the right side of users' Facebook pages with the notifications for friends' birthdays, weddings and other life events. For example, if your friend's birthday is coming up in two days, you'll now see a "give her a gift" link and the gift icon next to her name and photo. Clicking the icon will display presents you can buy, such as a Starbucks gift card, cupcakes or a teddy bear. The recipient will be notified through Facebook to enter a shipping address for the presents. In some cases, they'll be able to select their own cupcake flavors or size and style of socks. They can also exchange gifts for other items if they don't like chocolate or don't wear socks. The move represents Facebook Inc.'s first real foray into e-commerce. The company will take an unspecified cut from each item sold. On Thursday, possible gifts included gourmet ice cream, Andy Warhol prints, flowers, organic dog toys and spa packages. 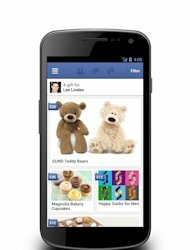 Facebook Gifts is the result of Facebook's acquisition of Karma, a 16-person startup based in San Francisco. Facebook bought the company on May 18, the day of its rocky initial public offering. Karma's mobile app let people send gifts to their friends on the go. Facebook Gifts, of course, works both on computers and mobile devices. Lee Linden, the former head of Karma, is now head product manager for Facebook Gifts, which he says incorporates "the heart and soul of the Karma experience." "We think gifting is a form of communication," he said. REUTERS - Demand for Apple Inc's (NSQ:AAPL - News) new smartphone, the iPhone 5, has exceeded initial supply, making it the fastest-selling iPhone ever and pushing the delivery date for some pre-orders to next month. Apple said on Monday that pre-orders for the new mobile device surpassed 2 million in the first 24 hours. A majority of pre-ordered phones will be delivered as planned by September 21, but many will not be delivered until October, it said. Pre-orders "have shattered the previous record held by iPhone 4S, and the customer response to iPhone 5 has been phenomenal," said Philip Schiller, Apple's senior vice president of Worldwide Marketing. It is not unusual for Apple products to sell out the first day. Orders for the previous iPhone, the 4S, the last product the company introduced before the death of co-founder Steve Jobs, surpassed 1 million in the first 24 hours, beating Apple's previous one-day record of 600,000 sales for the iPhone 4. Apple's U.S. store, at www.apple.com, on Monday morning showed pre-orders for the iPhone 5 would take two to three weeks to ship. AT&T (NYS:T), the No. 2 U.S. mobile service provider, said it set a sales record with the iPhone 5 over the weekend, making it the fastest-selling iPhone the company has ever offered. AT&T did not disclose how many iPhones it sold but said the iPhone 5 was still available for pre-order and would go on sale September 21 at AT&T retail stores. The phone's other carriers, Verizon Communications Inc (NYS:VZ - News) and Sprint Nextel Corp (NYS:S), also showed similar delays in shipping the phone. Topeka Capital Markets analyst Brian White said demand was well above expectations. "Given the much stronger-than-expected iPhone 5 pre-order sales, we expect a meaningful jump in the three-day sales results for the iPhone 5 compared to the over 4 million iPhone 4S weekend sales last year," he said. Although more consumers were opting for the pre-order method, White still expects long lines Friday when the phone goes on sale in stores. Apple began taking orders for the iPhone 5 at midnight Pacific time September 14 (0700 GMT September 15). Shipping dates for the slimmer, faster smartphone slipped by a week within an hour of the start of pre-orders. Apple previously said it would start shipping the iPhone 5 by September 21 in the United States and most of the major markets of Europe such as France, Germany and the UK. It goes on sale September 28 in 22 other countries. PS Vita set for launch on Wednesday — but will it sell?